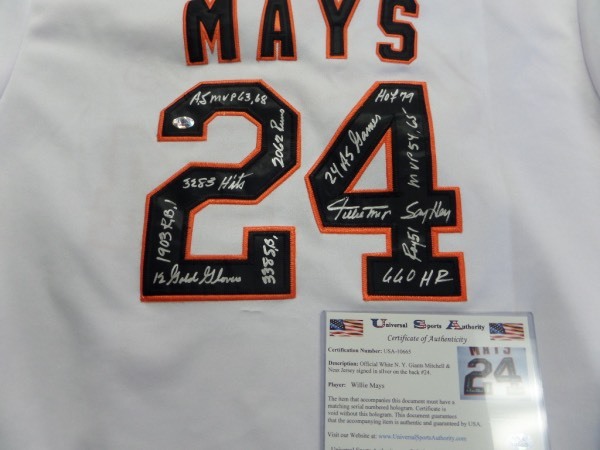 Coach's Corner - Willie Mays hand signed/certified Giants "Stats" jersey. Go Back to Lot List Willie Mays hand signed/certified Giants "Stats" jersey. This mint San Fran home white knit pullover is trimmed in colorful black and orange team colors, and has sewn on everything as well as name on back. It comes back #24 signed on BOTH numbers by Mays, and in bold, clean, perfect silver paint pen. It is loaded with stats and sayings, held together by the USA lifetime COA, and value on the Lee approved HOF investment is $1500.00 all day long.